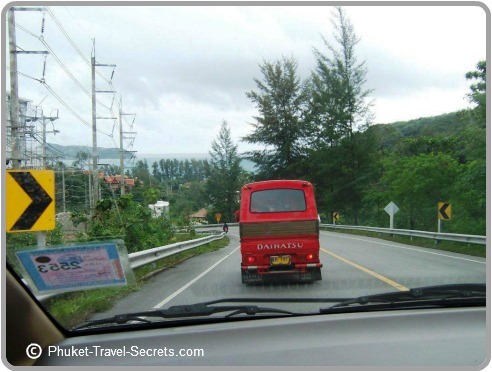 Driving in Phuket is certainly an experience and by far the best way to see the Island's amazing scenery. But, be warned it's not for the faint hearted! If you are planning on driving a car or motorbike in Phuket, ensure that you have an international drivers license. The next step is to decide if you you would prefer to drive, a motorcycle or a car. The preferred choice of ours is to hire a car, however over recent years, we have also hired motorbikes. Cars are a much safer option for driving around the Island, however they are also more expensive to rent. Only hire a motorbike if you have plenty of experience, as Phuket is definitely not the place to learn how to ride, and always wear a helmet, if you don't expect to get a fine. Before heading off on your travels around the Island, check the petrol gauge, as some cars and bikes are rented out with an empty tank. If you think driving is an experience wait until you pull up at the service station, and have to work out what fuel to use. The fuels throughout Phuket and Thailand are 91, 95, gasohol - E10 and diesel. If you are riding a motorcycle you can use either 91 or 95 and most cars will take either 95 or gasohol-E10. Throughout the Island there are many petrol stations except in Patong, where we could only find one. An Esso petrol station located in Phra Barami Road at the northern end of Patong. Many local shops and roadside vendors also sell small bottles of motorcycle fuel. When driving in Phuket you drive on the left hand side of the road or should I say that is where you are suppose to drive. Many Thai drivers, drive on the wrong side of the road, but don't do as they do. Most road signs are written in English as well as Thai. The speed limits across the Island varies like most countries from 60 km in built up areas to 120 kms on the main highway. Many Thai drivers don't seem to take to much notice of the speed limit, they have one speed and that is "flat out". Whilst most drivers have good driving skills they can be very unpredictable. Overtaking on the inside or running red lights is very common in Phuket, along with motorcyles weaving around through the traffic. Expect the unexpected when on the roads and always be vigilant whilst driving in Phuket. The main roads in Phuket are quiet good, most of them are flat and fast with a few areas that are quiet steep. The legal age for driving cars in Phuket is 18 years, although to ride a motorcycle up to 110cc it is only 15 years. If the motorcycle is over 110cc the legal age is lifted to 18 years. It is compulsory when driving to have on you a valid drivers licence, either a Thai or international permit. Every vehicle must have a tax sticker and third party compulsory motor insurance. Some cars in Phuket have red registration plates and are not permitted to drive at night or leave the province in which the vehicle is registered. Which brings me to a little tip! Driving around Phuket is not that hard during the day, but beware if driving at night, especially when it is raining. During the daylight we have no problems navigating our way around the Island from the North to the South, landmarks are easy to find and the maps are easy to read. Come night time with wet, slippery roads and dimly lit streets, it does get a little tricky. 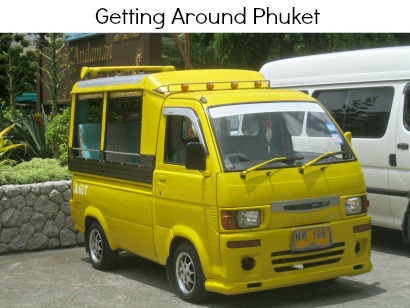 There are a couple of things you should beware of when driving in Phuket. When you see another vehicle flash their headlights, don't assume they want you to make a maneuver, in Phuket flashing lights means get out of the way. When you are out driving on the highways you may get caught behind a truck, if the truck driver indicates to the left it means that it is safe for you to overtake him, If they indicates to the right it is unsafe to overtake. In Phuket people will overtake everywhere, it doesn't matter if it is on a bend or a hill. We hope you enjoy driving in Phuket as much as we do.